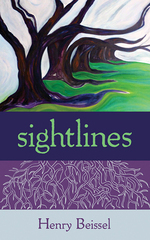 Sightlines by Henry Beissel is his seventeenth collection of poetry. Beissel had a long teaching career in English literature, and later in creative writing, which started as a teaching fellow at the University of Toronto. He taught at the University of Munich (1960–62)), the University of Alberta (1962–64) and Concordia University (Montreal) (1966–96), from which he retired as distinguished emeritus professor of English. For more than three decades Orion visited our sleep with his star-spangled sword, Jupiter and Mars wander up and down the shingled roof while Sun and Moon painted fleeting patterns across the pond. The poems change geographically but maintain the same descriptive force. Venice, Mexico and space are covered as well as a few passing references to dinosaurs. Beissel has grandchildren he writes for in this collection and there is no noticeable difference in the poetry’s composition, just the subject. Retirement has allowed Beissel to recall and share some fond memories of his life. The collection is open verse and welcoming to readers of either poetry or prose. This is a collection that any reader can fall into and enjoy the comfort of well-written poetry.